Are you waiting to get a product’s availability online or keeping track of a news? You need to visit the website again and again. But, You cannot sit and refresh the website to check when it changes. For solving this problem, you can use web page detection services. VisualPing is a nice service which solves this kind of problem. Unlike other web based change detection services, it is easier to use and completely free. After setting up the service for a web page, you will start receiving email notifications when the changes occur on the website. 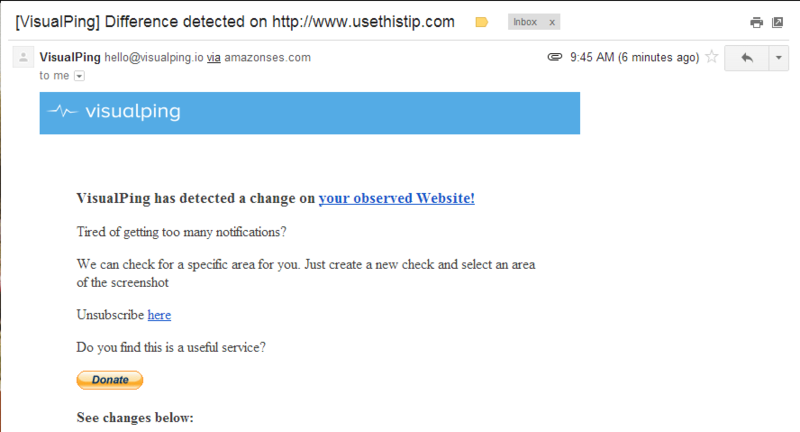 I created the email alert for usethistip.com and after publishing the article, I received email notification about the changes in the website. You can also test it to get notifications of a blog. You can also add it for Google Play to get a notification when new games come. VisualPing.io does seem to be a nice and useful service. This tool is great for that website that does not have RSS. For shopping websites, it is very useful. You can set alert for coming soon products. Try it and share your words about this service via comments.